Synthetic peptide (Human) - mapping to the C terminus of Bcl 3. Our Abpromise guarantee covers the use of ab27780 in the following tested applications. WB Use a concentration of 1 - 4 µg/ml. Detects a band of approximately 60 kDa (predicted molecular weight: 47 kDa). IHC-Fr Use a concentration of 20 - 40 µg/ml. Note=A chromosomal aberration involving BCL3 may be a cause of B-cell chronic lymphocytic leukemia (B-CLL). Translocation t(14;19)(q32;q13.1) with immunoglobulin gene regions. Polyubiquitinated. Ubiquitination via 'Lys-63'-linked ubiquitin chains is required for nuclear accumulation. Deubiquitinated by CYLD, which acts on 'Lys-63'-linked ubiquitin chains. Deubiquitination by CYLD prevents nuclear accumulation. Nucleus. Cytoplasm. Cytoplasm > perinuclear region. Ubiquitination via 'Lys-63'-linked ubiquitin chains is required for nuclear accumulation. Publishing research using ab27780? Please let us know so that we can cite the reference in this datasheet. with knockdown, but basal levels between cell-line appear identical. would also like to check the antibody detects our overexpression plasmids. In completion of my findings I will do the required abreview. I&apos;m quite excited that we may have found a &apos;working&apos; Bcl-3 antibody. Thank you very much for that feedback. 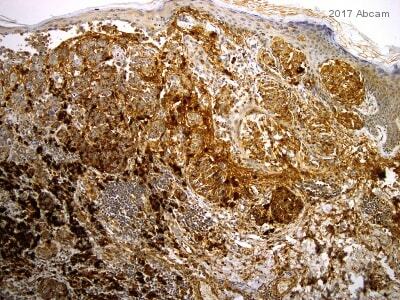 I am pleased to hear that the anti-Bcl3 antibody ab49470 is showing promise in your experiments. This information would be very valuable to other customers so I would be very interested to hear when you have submitted the Abreview with your findings. Equally, it is disappointing that the ab13708 did not work very well for you. If you would not mind submitting a review with these results, it also allows customers to evaluate the antibody in light of your results. This should only take 5-10 minutes and you will be rewarded with Abpoints which can be used to claim Amazon vouchers or credit for future orders from Abcam. If you could let me know once you have submitted your reviews that would be great as then I can be the one to review and publish them. As I know the background to this case I can make sure they are published to the website in the correct way. If I can be of any further assistance, please do let me know. Until then, I wish you all the best with your research. freezer full of Bcl-3 knockdown western samples and matching RNA preps. This would be a really good test for the antibody. so expect a slight delay. That is no problem at all, we would be happy to receive the feedback whenever you are ready to give it. I have now arranged for the two antibodies we discussed to be sent to you (free of charge). The antibody ab13708 is however not directly in stock and I have an estimated date of delivery onFriday the21st of September. As you are going away, would you prefer for me to delay the delivery until you are back? If so, which date would be most convenient for you. brought up numerous non specific bands. I can provide you any antibody which you would prefer. Ab13708 is marginally more popular but not by much. I will also check if we have any information on if the mouse monoclonal ab49470 is likely to work in western blotting as this has been quite popular for using in IHC. I look forward toreceiving your reply. I have checked the QC data for the particular lot of ab27780 you have been using and it looks as clean as the Western blot presented on the datasheet of this product using Jurkat cell lysate. One thing that may be worth trying is that we use BSA in blocking, not milk as you have used (this can sometimes make a remarkable difference in the results observed, as presented on the datasheet of ab9385). However, I understand that you have spent considerable time in trying to optimise this experiment and I can arrange for a replacement antibody to be sent to you if you would like? We do not unfortunately have an alternative lot to the one you tried of ab27780 but I could arrange for an alternative antibody altogether. I can even send you the antibody ab49470 although we have not as yet tested this in Western blotting. Alternatively, if you would prefer, I can arrange for a credit note or refund to be raised. Phone call reporting problems in using the Anti-Bcl3 antibody (ab27780) in western blotting. Thank you for calling us yesterday and for alerting us to the problem you are experiencing with theAnti-Bcl3 antibody (ab27780) and sorry for the delay in getting back to you. We take product complaints very seriously, and investigate every product that we feel may not be performing correctly. As we discussed on the phone, I haveattached our questionnaire so that we can gather further information regarding the samples tested and the protocol used. OnceI have receive the completed questionnaire,I will look at the protocol and see if there are any suggestions we can make that may improve the results. This information will also allow us to investigate this case internally and initiate additional testing where necessary. If the product was purchased in the last six months and is being used according to our Abpromise, we would be happy to replace or refund the antibody. unphospho-BCL-3 band, need further investigation. GR54873, so things do not go belly-up again. Could you arrange this for me? I am pleased to hear that the ab49470 worked for you. I am currently seeking information as to whether we have a further 5 vials of the lot you tried in stock. I will get back to you with this information as soon as I have it. I am pleased you submitted all the Abreviews. I will have a look through them by the end of the week and will let you know if there is any further information needed. I think this will be very valuable information for our customers. Thank you very much for doing this.